"It's not only that we play every time the same pieces ... it's that we also play these pieces every time in the same way and people expect it. You know like you go to the restaurant and you expect every time the same dish. So not more salt, not less pepper...every time the same. I'm sure everyone would get bored with it, no?" 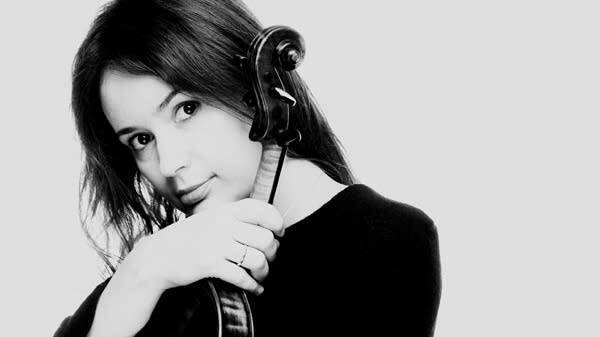 That's why Moldovan violinist Patricia Kopatchinskaja pushes the envelope in every performance, one of which recently won a Grammy Award for best chamber music/small ensemble performance. It's a program exploring Schubert's 'Death and the Maiden,' recorded live with St. Paul Chamber Orchestra. Kopatchinskaja created a string arrangement of Schubert's quartet. Between the movements are musical interludes from other composers of different eras. Were you at all surprised when it was nominated for a Grammy Award, and then won the award? "Yes, I was surprised because it's not a perfect CD, it's not something where you can show how great you are. But it's a CD which just documented a moment of a life of a very funny group of people, creative and curious and daring. Yes we were very daring because you know working in the classical music business, it is daring even not to wear shoes onstage. People speak about it years longer. "When I thought about Schubert I imagined that I am a gallerist, so I'm going into into a gallery and I would like to see an exhibition which really touches me. And what I very much like as a consumer is to be surprised and to see juxtapositions. It's always about refreshing our perception. "When you imagine Mona Lisa in the Louvre and you expect to see again this picture. But instead of this picture you see a drawing of a child. You are quite shocked but then you start to rethink maybe Mona Lisa. So, I wanted to put Schubert together with other pieces about the same topic to make, let's say, a salad of known and unknown recipes." I know that you created this string arrangement of this string quartet, and you made a comment, something like you were a group of soloists coming together to create this piece. Can you expand on that a little bit? "I wanted to have as many colors as possible. So, when I let my neighbor play the same melody I just played, I expect another color, another character, another person. And this worked very, very well. We experimented with it a lot and actually even during the tour after the recording, we changed so many things. We are constantly developing this idea. It's like coming into a children's room and finding the same toys but inventing new games." Is there a moment in this program, as it exists on this recording, that is a favorite of yours or something that you really look forward to? "I really love the second movement of Schubert Death and the Maiden and I think this is the central piece of the recording. And I would say we also played it so well that I'm afraid to say but sometimes I'm even proud to have done it in this way. Every time we play the Schubert, every time we discover a new dream. It's like to dream together."